Summer has officially started here at my house! My son is finishing up his last day of school, he had his last baseball game of the season, and we've already sketched out a rough itinerary of fun trips and activities to keep us busy for the next couple of months. In early August, we'll be taking our official vacation to Carolina Beach, located on North Carolina's Cape Fear. With a name like Cape Fear, the area just SOUNDS like it should be running over with ghost stories. And, from what I've seen so far, it is! 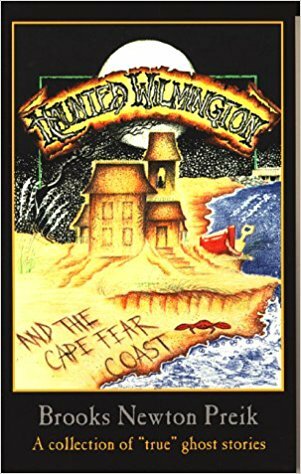 I mentioned on Facebook last week that my boyfriend got me a stack of books to add to my Haunted North Carolina shelf, including a really great selection by Brooks Newton Preik called Haunted Wilmington and the Cape Fear Coast. Over the course of about 140 pages, Brooks Newton Preik takes the reader all over the Wilmington area, sharing stories of the coast's most beloved ghosts. I really enjoyed this book because it reminded me of a good old-school collection of regional ghost stories. For each location, there's some history involved, but just enough to put the story in context without focusing too much on extraneous details. When available, experiences are told by those who had run-ins with the other side. The emphasis is placed on the folklore and the stories themselves, with very little, if any, critical analysis. As an added bonus, hand-drawn illustrations from a variety of artists complement the tales, and each chapter begins with a spooky quote, usually from a famous person or famous work of art. The book is well-written, well-organized, and overall is a fun and easy read. There's a good mixture of more 'personal' stories from private locations and stories from locations that we will be able to visit on our trip. I've already added a few must-see spots for our week down south, including, but not limited to, Maco Station (although the Maco Station light has unfortunately not been seen since 1977); Thalian Hall, which is said to be haunted by two Edwardian-dressed ghosts; and Oakdale Cemetery. We already had plans to visit the ghost of Bald Head Island, who is also featured in Haunted Wilmington, and perhaps we can also hit some of the historic district's spookiest homes and businesses. I would definitely recommend this book to anyone who enjoys reading a good ghost story, no matter what his/her geographical location may be. These stories are fun and interesting, and have definitely got me even MORE excited for our upcoming trip! Be sure to follow me on Theresa's Haunted History of the Tri-State Facebook for updates on my Wilmington trip and all of our other crazy paranormal-themed summer fun! And if you're interested in more Book Reviews, please see the link below. Have a great summer and stay spooky, ya'll.